Australia v India 1st Cricket Test Match at Adelaide turned out to be jackpot for me. 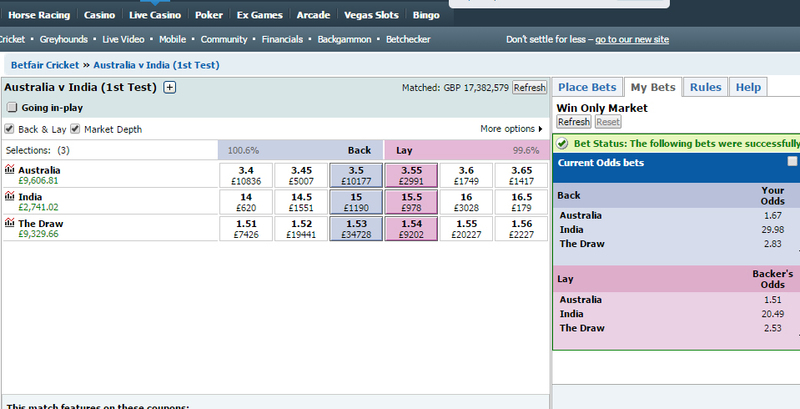 I managed to green up for over £9k of profit trading at Betfair by the end of Day 3. This match progressed as I predicted on Betting Adda. First of all the odds for India offered by bookies before the start of match were ridiculous and insulting to Indian team. All bookies got it complete wrong. All of them were offering around 8.0 odds for India which translates to about 12% of winning chance which was no where near my expectation. I would have accepted an odds around 4.0 but certainly not 8.0. All these online bookies clearly manipulated odds strongly in favour of Australia which is a normal practice. Bookies know that punters will back Australia no matter how low odds they offer. Punters fell for it. See the amount of money being dumped on Australia and compare it with that of India. On BetTrader tool you can see £10 million money on Australia while only £500k is on India. This is simply madness. I’m sure that 90% of all this absurd trading has been done by newbies who are too good in losing money. Since bookies were heavily favouring Australia I was expecting India’s odds to go up as high as 70+. I also predicted India to come back as this pitch is almost a dead pitch, ball is coming nicely on the bat and it has plenty to offer for batsmen. Anyone who has watched Australia’s first innings could have seen it clearly that this pitch is paradise for batsmen and offers no help to seamers. India has strong batting lineup all the way down till no. 7 and on any batting friendly surface they will always flourish. Add to that the fact that Australian pitches are not so hostile to batsmen. Match followed my prediction script. India’s odds went up as high as 55. I backed India all the way up to 55 and waited patiently for our men in blue to stabilize the innings which they did. I greened up when India’s odds were 10. I knew that bookies will not let odds go below 10 at least by the end of day 3. 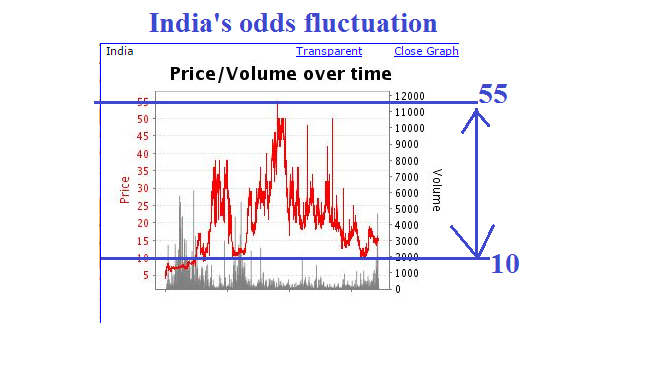 See below India’s odds fluctuations in the graph taken from Betfair. As you can see India’s odds went up as high as 55 and came down to 10 which gave me massive profit. So at the end of day 3 I’m in profit of over £9k on Australia and Draw. India’s winning the test is ruled out. Just to cover India as well I’ve £2k profit on India. So in worst case if India wins I’ll make £2k profit and in all other outcomes I’ll make £9k profit. I am winning Rs. 50000 on India and 53000 on aus and draw. Should I put my India profit amount into aussies or let it remain as it it. Match is heading towards draw. It’s less likely that India will win unless they bowled out Kangaroos in less than 50 runs and then chase it down at last day. Aussies are leading with 363 runs and they would add another 150 before declaring. They will eat up at least 1 session leaving India to bat for 70 overs or so. India will not take chances of chasing 400 odd runs and they would be happy to draw. Since your Tarazu is perfectly balanced I would say leave it as such. If you want some adventure then move 40% of India’s money on Draw, 30% on Australia and keep rest on India. Brother what are your prediction for 2nd test.